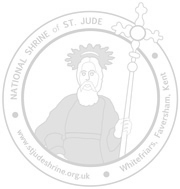 For many years, the National Shrine of Saint Jude has promoted the Carmelite devotion to the souls of the departed by establishing a Dead List that is renewed each year. The Carmelite Holy Souls Society reminds us that the Church is not confined to this world, but extends into the next as well. By praying for the dead, as we prayed for them when they were alive, we can establish a special link with the communion of saints. In a way this is a two-way street. We remember them in prayer and we ask them to pray for us. It is a helpful reminder that our brothers and sisters who die do not lose their identity, or their relationship with us. They remain the people that they are and the core of their identity is carefully reserved by God as they are transformed by God’s love and set free to love. You may be increasingly aware of just how much unfinished business we have in life. Things we may have said or done which we shouldn’t have, and which we now cannot put right. Often, once a word leaves our mouth, we lose all control over it! Prayer, true prayer, is always an act of love. Our Catholic Christian tradition assures us that our prayer for the Holy Souls is one of the ways in which God loves our departed brothers and sisters into life in all its fullness. It is a gift of the tenderness of God to allow us to share in this loving process. People simply send in their lists of dead relatives and friends to be included in our prayers for the Holy Souls. All those on your list will become members of the Carmelite Holy Souls Society for the year. 3. A share in the Masses, prayers and good works of the whole Carmelite Order. There is no fixed membership fee, or annual subscription. Please simply donate what you would like to become a member. You can either donate and send in your names via our online service, or by printing a form and sending it to the Shrine office. To encourage devotion to Saint Jude, it is common to acknowledge in writing any favours received from God by the saint's intercession. Our novena for Easter starts on 13 April and can be prayed for the next nine days until 21 April 2019.